The Peugeot PX10 frame has caught many an eye whist hanging on display in the shop. In the end Hayden was the who snapped it up for a single speed conversion build. Hayden wanted to keep the classic style but needed to be able to ride it daily into the city center. Running it as a single speed conversion allows for pleasurable, hassle free riding day after day with the minimum of maintenance. A classic leather San Marco saddle was matched with Brooks leather bar tape to keep the finishing touches a cut above. While MKS pedals, Tektro brakes and Panaracer tyres (a favourite of ours) ensure reliability. All in a special ride for regular use. This Fondriest frame is such a stunner and was a pleasure to build up into a fast weekend racer. Strictly for special occasions and lovely weather. Full Campagnolo groupset, Cinelli stem and bars and suede saddle and bar tape keep the classic style and feel fantastic to ride. This is a bike that makes you look forward to the return of nicer weather! Ben got in touch to ask us to build him something more ‘everyday’ for commuting and more relaxed rides into town. We had a gorgeous Rory O’Brien frame that fit the bill perfectly so we kitted it out with a 1x drive chain, big risers and PDW full metal fenders. The speed with which we have updated this blog is so slow that this was all a year ago now and since then Ben as got us to change the bars to some Ergotec Moons which sweep back rather than risers. There’s nothing like a classic steel bicycle to get you smiling as you ride around town, just ask Ben! We had already done some work for Peter servicing a Pat Hanlon and Bob Jackson he owned when he noticed the Pat Hanlon frame we had in our shop. The dimensions where almost identical to his and so all that was needed was a vaild reason to get another bike. A reason was easily found and so we built up this beutiful frame with sunny Sunday riding in mind. The components are a mix but all where picked with the desire to stay true to the classic feel of the frame. We were asked to build a single speed/ fixed gear bike as a birthday present for a very lucky customer. 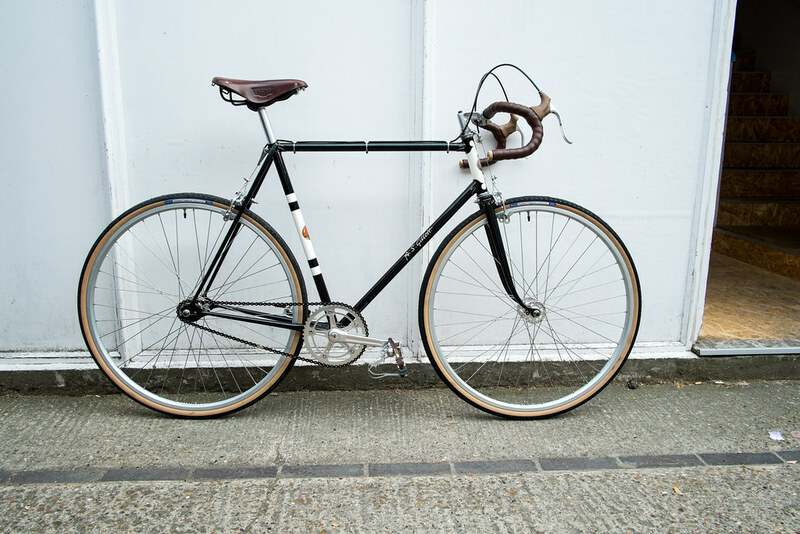 The Gillott was the only real option, a stunning 50’s path racer built by a true legend. To keep things as classic as possible we handbuilt a pair of 27″ flip-flop wheels that would look the part whilst being study enough to go through London on a regular basis. Matching them with Panaracer Pasela’s was a no brainer. The Brooks leather saddle and bar tape provide the right look, feel and quality to match the frame whilst the Izumi track chain adds a discreet bit of gold to match the lining around the lugs. Happy Birthday! Paul fell instantly in love with the Shorter frame we had in stock. After many years riding on a too small MTB it seemed right to get a road bike with such style and history. The Shimano 105 groupset provides quality shifting and reliable easy use. Our favourite Lizard Skin DSP tape ensure comfy handling. Whilst the Cinelli stem bars keep true to the classic feel of the frame. Tough tyres are essential for London so we fitted a pair of Schwalbe Durano plus. Paul was delighted with the results, a fast, fun bike with a classic steel frame at its core. Theo had a simple brief, a tough uncomplicated bike he could cycle anywhere around London. We used a re-sprayed Charge Plug frame as a solid start for Theo’s robust single speed. The high spoke count matched with wide tyres make for a strong, reliable set of wheels. A BMX stem and handlebar set keep the riding position comfortable. Whilst the large, flat Wellgo off-road pedals keep even the biggest boots feeling secure. As on other builds we’ve gone with powerful Tektro dual pull calipers for instant stopping. Overall this bike is seriously fun to ride in all its ruggedness. Vincent brought us his Mike Ives Reynolds 853 track frame and asked us to build it into something that suited the high quality 853 tubing. We started by building some Goldtec hubs on to Ryde Pulse Comp rims with doubled butted Sapim spokes. These wheels are light enough to match the featherweight frame but still have the bombproofness that Goldtec hubs bring. The stealth build was perfectly suited to some SRAM Omniums. The Zipp stem, Thomson layback seatpost and Flite titanium saddle all continue the theme of light, high quality and stealthy looking parts. The final touch was a gold Chris King headset just because. It may be freezing out and well and truly winter but we hope this bike will be flying around London throughout it.